Craig y Ddinas, nowadays a popular venue for walkers, climbers, gorge walkers and cavers, was once a thriving hub of industrial activity. The nearby Glyn Neath Gunpowder works extends for a distance of about 2 miles along the Afon Mellte, and the Sychryd Gorge was a centre for mining of silica rock, a substance which for very little work could be made into a high quality firebrick suitable for a variety of uses from domestic fireplaces to lining iron and steel furnaces. So high was the quality of these that they actually became known as “Dinas Bricks” and were exported to both Europe and America. 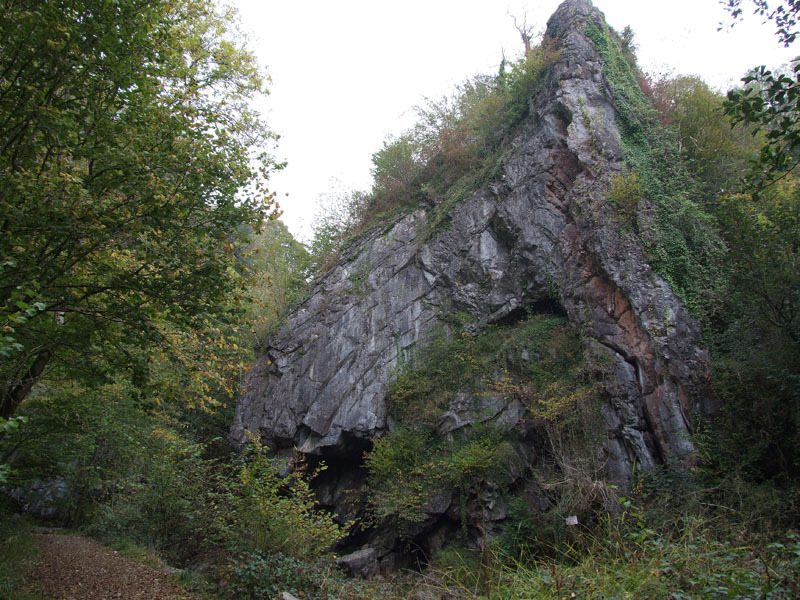 The silica rock was discovered in the 1780s and exploited thereafter, in 1807 a tramway was installed to take the product to the Neath canal. The first large scale mining at Dinas was by a William Weston Young. Young was born 20 April 1776 into a devout Quaker family. Educated at Gildersome Quaker boarding school in Yorkshire, he gained a rudimentary knowledge of science which he was to apply in his invention of the silica firebrick. After a flustered attempt to emigrate to America in 1794, Young settled back in Bristol, found employment and married fellow Quaker, Elizabeth Davis, in April 1795. In 1798, Young had acquired the financial backing to lease a farm and water mill from John Llewellyn of Ynysygerwn, at Aberdulais, in the Neath Valley. After a lucrative start to his new venture as a miller, corn-factor, and farmer, some unfortunate business dealings brought him to bankruptcy in May 1802. He managed however to secure some funding from a fellow Quaker with which he managed once again to set himself up in business and went on to be a potter and wreck raiser amongst other things. Unfortunately he had some bad experiences where fine porcelain was ruined in the firing. Young's experience of firing ceramics, together with his familiarity with the region as a local surveyor and his amateur interests in geology enabled him to conceive of a heat-proof, blast-furnace brick, using silica found in large deposits at the head of the Neath Valley. The process of "vitrifying" the walls of a ceramic brick-built furnace had been patented by William Harry, of the Swansea Valley in 1817, but Young's solution was to build the whole furnace from a "silica firebrick," made with a 1% addition of lime, to bind the blue-grey "clay" of the Dinas rock. The idea being that the interior of the blast furnace would vitrify and be vastly more durable and ultimately economical, than a mere veneer of silica within a comparatively fragile ceramic shell. Young made early experiments with the recipe and fired his trial bricks at the Nantgarw Pottery kilns, while he and Pardoe finished the Billingsley porcelain for sale between 1820 and 1821 when he finalised his recipe. In 1822, Young applied to the Marquis of Bute to lease the lands near Craig y Dinas, Pontneddfechan, in the upper Neath Valley for a period of twenty-one years. 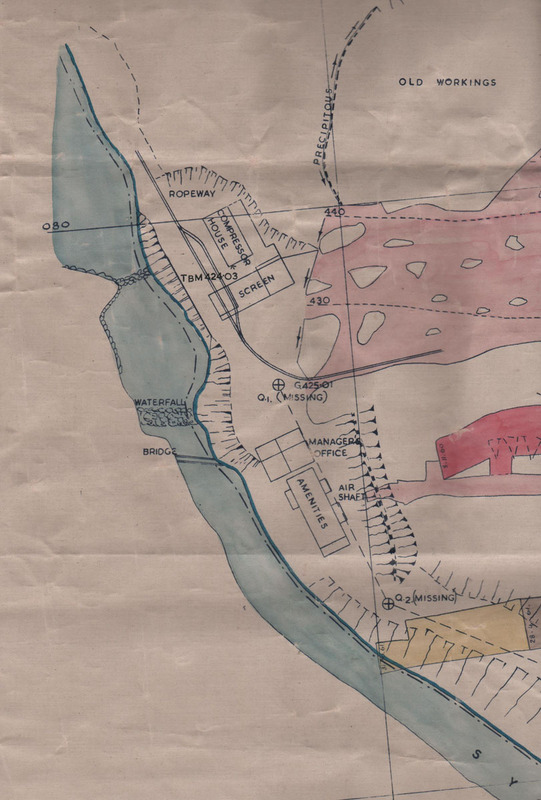 On 19 October 1822, the Dinas Fire Brick Co. was established in a partnership involving David Morgan, a Neath Ironmonger, John Player and Joseph Young and a brickworks was built at Pontwalby, about a mile down river from Craig-y-Dinas. The company sold bricks to industry across the world, and was transferred through many hands, but the Young family, held their shares throughout, finally passing via Joseph Young to his son William Weston Young Junior (1798–1866). From "The Dinas Firebrick Co." to "John Player & Co." in 1825, to "Riddles, Young & Co." in 1829 and finally, becoming world famous as "Young & Allen" in 1852, the company brochure later mentions that it had supplied firebricks to Swansea's White Rock Copper Works for forty years. 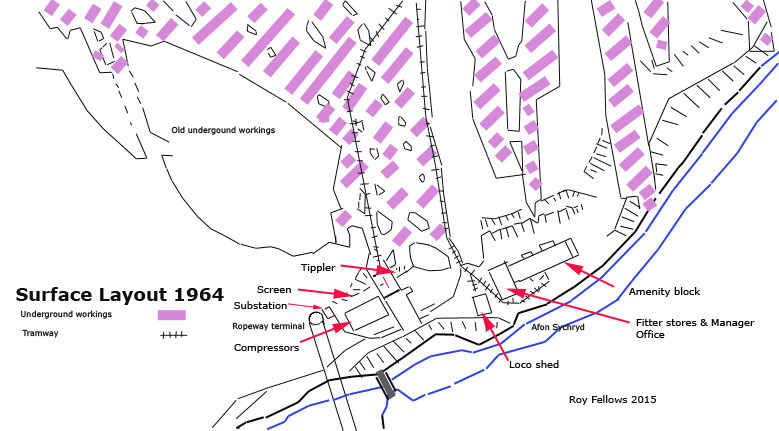 Initially, extraction was by opencast working marked on old maps as "Quarries" and on the abandonment plans as "old workings". 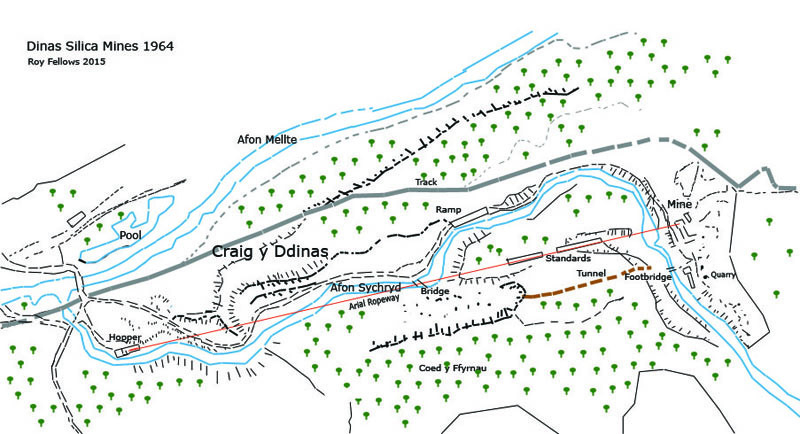 During this period of working the mines produce was trammed out of the upper mine entrance and across a bridge over the Afon Sychryd, From here it entered a tramming tunnel, now known as Bwamaen or Middle Silica Mine, and then out of a lower entrance. The underground route descends as a gentle inclined passage. From there it re-crossed the Afon Sychryd by another bridge, the piers for which can still be seen at an area where the track widens and there is a picnic table. From here followed the north bank along a tramway which extended for about two miles. A branch to the south ended at a loading bay at the Great Western Railway while the main tramway ended at a loading bay south of the Pontneddfechan Road, later lost in road improvements. 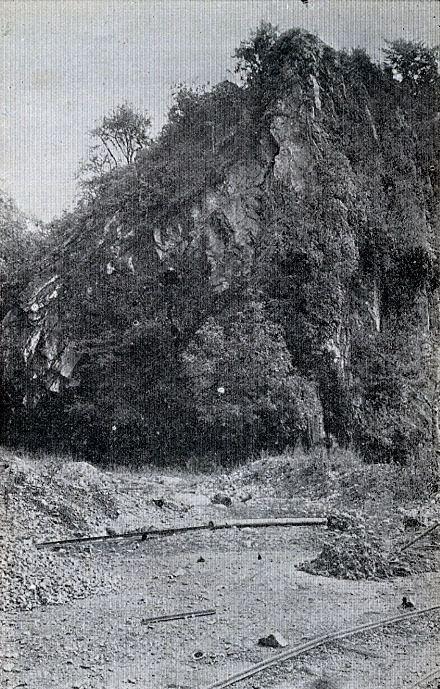 Below is a 1908 photograph of the Bwamaen rock with the mine tramway in front. The original is incorrectly captioned as "Craig-y-Dinas inferring that its Dinas Rock. Courtesy Mike Stokes. Mining continued until about 1921 when the mines closed for while, but restarted in 1930 when a new 2 ft tramway was laid from the mine along the north bank of the Afon Sychryd. Here mine trucks emptied into a hopper where the produce was drawn off into trucks waiting below. Empty trucks were pushed past the hopper along a continuation of the tramway along a ledge cut into the rock which can still be seen, but each end has now been blocked off for safety. Precise information is scant and this is put together from a study of old maps and other information. A problem here was a sudden drop of about 50 feet adjacent to a water fall which made access to the mine difficult. This was solved by the erection of an incline ramp using steel girders concreted into the rock. Some accounts describe the 'incline ramp' as an ore chute with produce going directly into lorries below, it may have served both purposes with trucks being raised by a winch and cable to get materials up to the mine, but in the absence of any photographs or factual description, its impossible to tell. There is no way even a small lorry could turn around in this area at what would have been the base of the chute, however there was plenty room lower down opposite the bridge from the old tramming level. (By the current picnic bench). Lorries could have turned around there and then reversed backwards up to the chute. Haulage above the incline ramp was by horses up until the time of the second word war when two locomotives were purchased. The final phase of working by Richard Thomas and Baldwins Ltd included the installation of an ariel ropeway as illustrated in the little plan below. Many features associated with this can still be identified by anyone prepared to do a bit of scrambling. This effectively made the incline ramp redundant and it was boarded over to make a pedestrian walkway, it may also have taken a light vehicle. The mine closed for production in September 1962, being officially "stopped temporarily". Only the manager and one other man were working here in August 1963, and the manager was delighted to take me down the mine to see his one remaining locomotive. We proceeded to light acetylene lamps, and wound our way down the rather wet workings to a dry spot about four hundred yards down where stood 69, a four-wheel diesel, Ruston & Hornsby 201996 of 1940. Very obviously ex−Government, Mr. Thomas said it had been received from a London dealer about three years ago; another Ruston diesel had gone back to him in part exchange. Two other Rustons had been sent down to RTB’s Landore works when the mine closed, as both wanted attention, and they are now in store there following overhaul. A visitor to the mine in May 1961 noted three Ruston diesels – 217980/46, 223730/46 and 277292/49 – but not the one cited above which presumably was down the mine at the time. The mine has been worked since the 1830s and there are dome fairly steep cable inclines going down into the bowels, most of which are now flooded. The present modus operandi is cable operation to an adit top immediately above the one which now forms the mine entrance, where a very small gantry line leads to the top of the aerial ropeway. The latter climbs up one side of the hill, and from there the topmost pylon carries the full strain of the drop to the bottom; the manager said it was the longest aerial ropeway span in the country. he is proud of his mine although its future is one with a large question mark. Quartzite is extensively used for steelworks furnace linings but demand has dropped sharply, for RTBs new Spencer works uses none at all. There is an underground incline with an electrically powered winch still to be seen underground, and this could be what Semmens is referring to, with produce being trammed to an ariea above the mine for offloading into the buckets of the rope way. A lot of this unfortunately is speculative. The surface was stripped of locomotives, trams, Arial ropeway and all that could be moved by Eastman’s of Swansea in the 1970s, but the incline ramp in deteriorating condition remained on site for about another ten years. The mine buildings were demolished possibly earlier and all the rubble dumped into the mine. 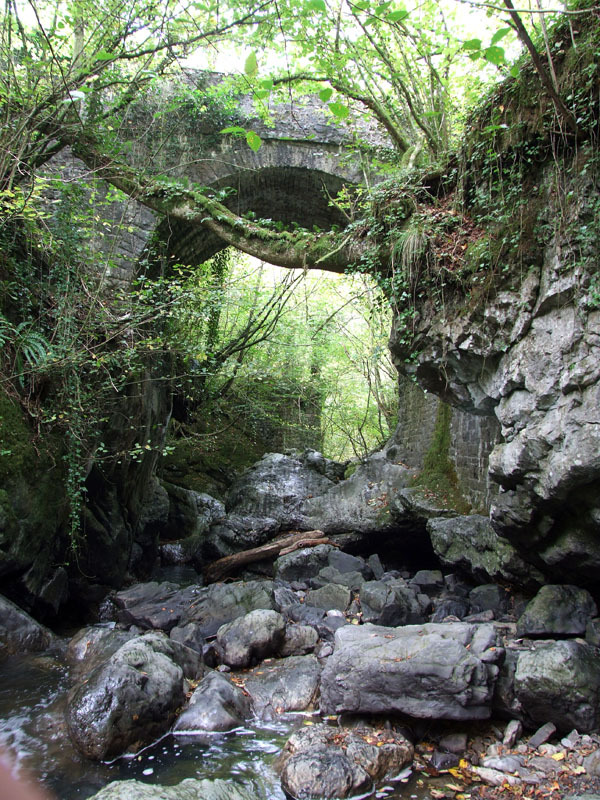 It had steel column uprights, the burnt-off bases of which are still visible in places in the ravine and river bed. There was a deck which sloped at about 25, maybe 30 deg, rising from west to east and about 8ft wide of transverse timbers, probably no more than 3in thick and with a couple of inches between each timber. There were no obvious signs of sleepers, rails, or bolt holes but it did have a steel handrail which is what makes me assume it was mainly a pedestrian access. By 1974, some of the deck timbers were rotten and a few broken and missing, so it was necessary to walk up with your feet above one of the two longitudinal RSJ's which were a couple of feet in from the edges. My recollection of the overall length is less clear but I'd guess at 150ft which suggests a rise of around 50ft. Now everything lies quiet and idle with nature gradually claiming it all back. Underground little has changed bar the inevitable roof falls and flooding of the lower workings which have become a popular venue for divers. Surface Layout 1964 scanned from abandonment plan. From the Dinas Rock car park its but a short walk along the old tramway route, now a made up path, to the start of a the incline ramp where there is a large concrete area. On the way, the visitor will have passed on the opposite river bank the Blue Dinas Silica Mine and the uprights of the tramway bridge from Bwamaen. 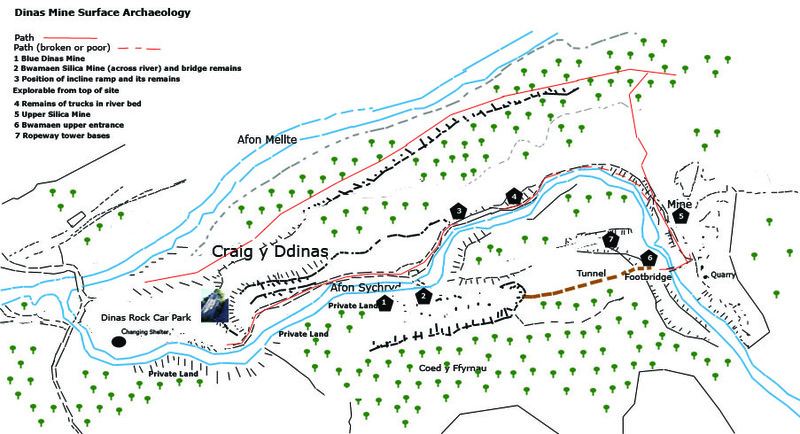 Please note that Blue Silica is not part of Craig y Ddinas Mineral Estate but private property. If one takes the northern path above the car park after a very steep climb a descent to the right will reach the Upper Mines. Here one can follow the Afon Sychryd downstream past a series of old trucks put the to support the bank but now mostly washed away, eventually reaching the top of the incline ramp and the rock cut ledge. Back at the mine there is a footbridge which leads to the upper entrance of the tramway tunnel, again this is not Craig y Ddinas property. Here is a link to photographs taken by Mike Stokes in 1992. The rake of trucks by the river bank is still intact.